The Constitution says, 'We the people...' not 'The government and the citizens...' Boundaries don’t matter." Image by opensourceway. According to a recent report from the National League of Cities, 75% of American cities report an overall worsening of economic conditions and 68% have shelved or canceled capital projects. Cities are hurting and officials are asking “What to do?” Look to the citizens. Hard times are opportune times to engage citizens and welcome the growing desire of the public to be heard and participate in civic government. Traditionally, some citizens have had the mindset of putting taxes into the government “machine” with the expectation of services coming out. But a shift away from this idea is occurring and more citizens see themselves as role players capable of creating change themselves. 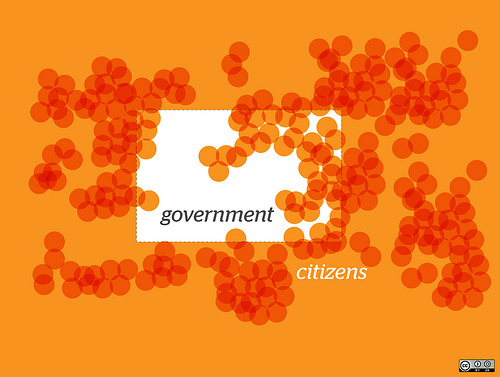 As citizens take up that role, direct interaction with their cities rises and typical government expenses can be crowdsourced among ordinary people with the end result of such expenses being reduced through citizen participation. Services like SeeClickFix, the online mapping tool that helps citizens take direct action to fix problems in their community, and other technology have been key to getting the voice of citizens heard by public officials. Some cities could be a bit wary of the shift, seeing it as giving up control, but, in reality, it could very well be a solution for cities in hard fiscal situations. For example, it’s typical for a city to hire city inspectors to go throughout the city to find problems, like potholes or broken streetlights, and report them back. However, appealing to citizens, instead, as happened in Durham, North Carolina recently, results in less overhead for cities and leverages the voices and knowledge of those who live in the community. Public engagement initiatives such as San Francisco’s Urban Forest Map, Chicago’s GO TO 2040, New York’s PlaNYC 2030, Los Angeles’ SurveyLA, and Washington D.C.’s Capital Bikeshare Survey have been successful in bringing the public in to a participatory role in data collection, city planning, and vision setting activities. Such projects are examples of undertakings that would most likely be too big and cost-prohibitive for a city to carry out and continue on its own. Yet by asking citizens to participate, not only does it keep costs low but empowers citizens, brings together new ideas, and increases mass collaboration.